Stayed home and did some sewing. Today would have been my Dad's birthday. He would have been 86. I think with Mom passing this year I was more aware of today. He passed away 18 years ago. I will post pictures either later today or tomorrow. I have a few things to do today. Mary, my thoughts go out to you on your Dad's birthday, or I guess it was yesterday, which was also my husband's birthday. 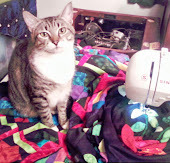 Kind of a sad day, I'm sure, but at least you got to do some sewing! I love your little chipmunk pic - we've had one living around our mini waterfall in our backyard this summer. And now we have a little toad living in the pond. Have a good rest of the weekend!